A month ago at Mobile World Congress, Skype and Verizon stole the spotlight by announcing Verizon’s forthcoming Skype mobile service. This afternoon at CTIA in Las Vegas, Verizon and Skype announced that the service will launch in two days on Thursday, March 25 (think Christmas in March). If there was one overriding theme that came out of the press conference today, it was “it’s about the user experience”. Skype’s Russ Shaw emphasized this during our CES interview in January; Josh Silverman, Skype CEO and John Stratton, Verizon Wireless Chief Marketing Officer, reinforced this during the Mobile World Congress press conference. So what is this “user experience” that “it’s all about”? Make it as easy to make a Skype call as to make a circuit switched wireless call. Find a name in the address book and press a “Call” button. Two other points made: the service is CALEA-compliant and E911 access remains available via the Verizon voice channel. Skype calls can only be made while on the “Home” Verizon network in the U.S.
One final note: When asked about exclusivity, Skype’s Russ Shaw, GM for Mobile replied to the effect that “the Skype mobile experience is exclusive to Verizon” and that “features and functionality won’t be elsewhere”. 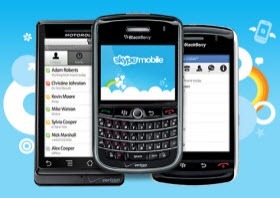 Leaves a lot open to interpreation; we’ll see as Skype for Symbian and Skype for iPhone evolve. Bottom line: While it will be a great service for Verizon’s customers wherever they are in the U.S., there are limitations such that the service is not available for international travel. It’s a service that is not only available to new customers but to their entire legacy base of BlackBerry and Android users. Yes, this post only covers the basics; more commentary to follow.